In 1982 I took a short trip across the Texas border near Big Bend National Park into the desert of Northern Mexico. We rode through the hot, barren sand for several miles before coming upon a massive rock formation surrounded with lush green vegetation. The roar of a waterfall could be heard in the distance and soon we saw the rushing water between the walls of the canyon. As we rode further we saw Indian pictographs which were painted thousands of years before decorating the sandstone out-croppings. After enjoying several minutes of the cold, clear pleasures away from the desert sun, it was time to head north again to Texas. Mexican folklore warned that no one should be found in the canyon after dark because it was haunted by ghosts of "Aqua Frio." 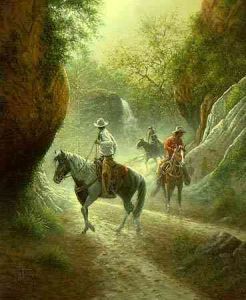 So we rode away, amazed at this oasis in the desert, we were the "Riders of Mystic Canyon."